So off we went to Old Ottawa South on a frigid February night, and again on an even colder night in mid-March to find the man who had ‘moved on.’ But no luck. He happened to be off both those evenings. As disappointing as that might have been, we nevertheless ate damn well on dishes that reminded us of Domus days. And such a pleasure to see Kristine Hartling in the kitchen, last seen chef-ing at The Urban Pear, (during the bumpy months post-Ben Baird.) She had been, in my various visits to try to figure out the new UP, responsible for the one bright-light dinner we had in a string of pretty dim ones. And she was again plating pleasures, this time at Taylor’s. Service, at my second visit, was in the capable hands of sommelier Rémy Urquhart (whose roots with his father’s Black Cat Bistro go pretty deep). That eternally youthful guy elevates every restaurant’s front of house I have ever known him in and this proved that. In the meantime, there is squash and there is rutabaga. 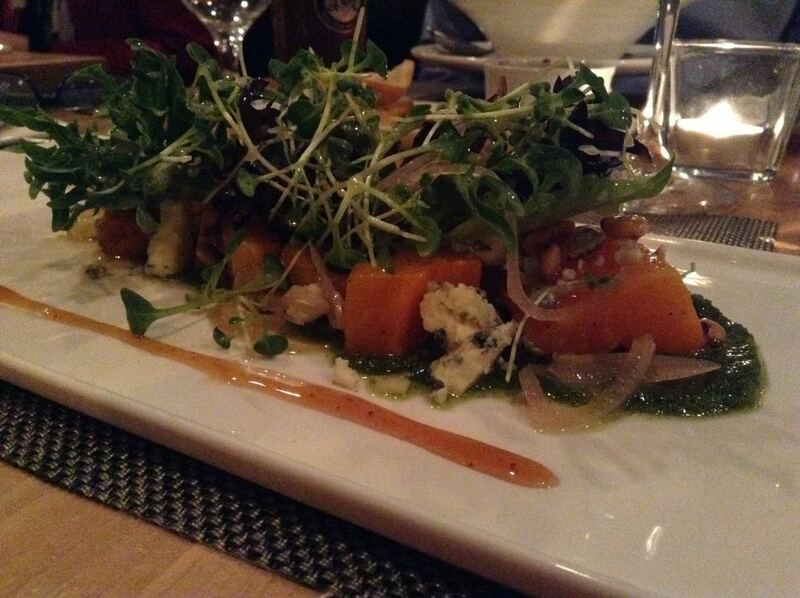 Perfectly cooked cubes of roasted Butternut in a bright wintry salad, the sweet squash paired with dobs of smoked blue cheese, pickled shallots, baby lettuces, all plated on a bitter green puddle of rapini pesto. The combination of sweet and bitter and smoke, with a crunch of pine nuts, worked beautifully together. Rutabaga and celery root teamed up in a terrific seasonal soup with apples. 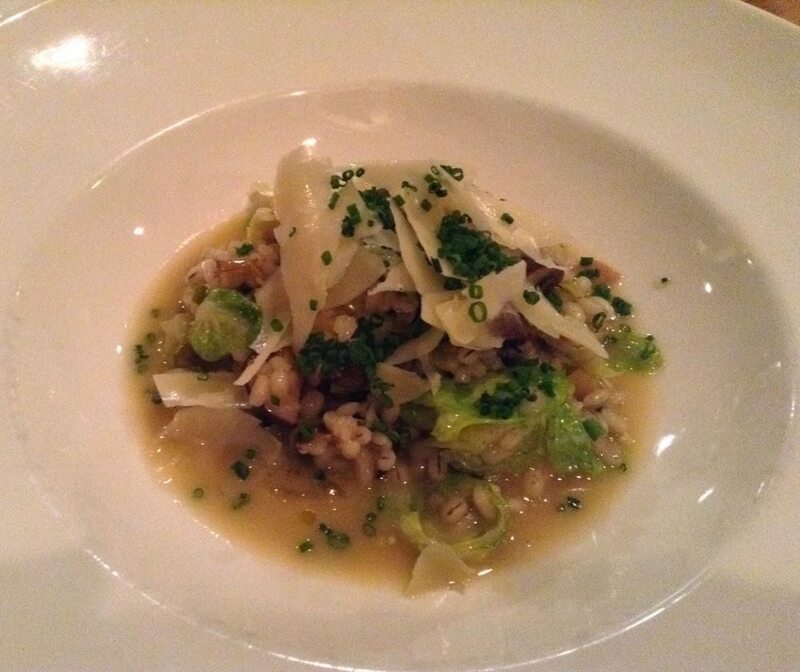 An appetizer portion of barley and leek ‘risotto’ was flawlessly executed, the barley with some campfire flavour, texturally bang-on, oozing a buttery broth, piled on with roasted Brussels sprouts, snipped chives, and shavings of Grana Padano. 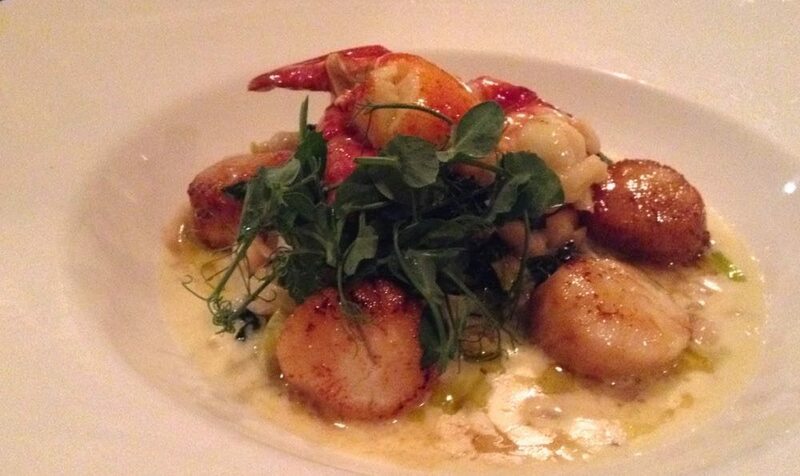 On to mains: our Coast to Coast Fish came in a shallow bowl which held a half-inch pool — a creamy, briny leek bisque — over which was placed five perfectly seared scallops, crowned with butter-poached lobster. Yum. The Land Selection was pink pork with broccoli rabe, white beans, squash, and mostardo. Apple gingerbread cake for dessert, and something gorgeously chocolatey. I’m sorry. I forget. In Taylor’s Genuine, John Taylor has created an honest neighbourhood wine bar, casual and easy, with refined, approachable service, one designed to gather locals several times a month, rather than those twice-a-year treat-seekers at Domus.